The relentless nature of caring for a loved one with dementia takes a huge mental and physical toll on family members. In this article Camille Leavold, Managing Director of Hertfordshire Home Care Provider, Abbots Care, explores why it is essential to see help. For families with elderly loved ones in need of care, it is often desirable to provide that care in the home environment. There are numerous benefits to this arrangement, such as ensuring the person being cared for remains in familiar surroundings, supported by familiar people, minimising the disruption they go through. However, while this desire is both understandable and admirable, it is important that those caring for loved ones also take the necessary steps to look after their own well-being. After all, providing regular care can be both physically and emotionally draining, and 'caregiver burnout' is a common experience. One of the most effective ways to manage this is to seek support from an agency that offers respite care facilities for elderly service users. 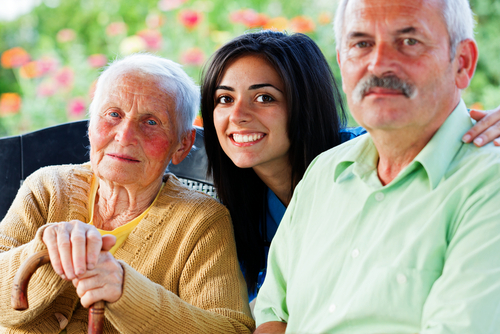 This article examines why a good quality domiciliary care service is so important. One of the reasons why respite care is so important for families is because carers are often overworked and overwhelmed by the responsibilities they take on. In fact, research shows that 26 percent of those caring for seniors experience distress, and this figure rises to 45 percent when the care is related to dementia. In terms of reasons for this, care work itself can be extremely demanding and the emotional toll can be even greater when a carer is seeing the health of a loved one deteriorate. In some cases, the person in need of care can become increasingly frustrated too, which can lead to conflict. Of course, in addition to all of these factors, carers sometimes spend dozens of hours a week looking after a loved one, often while balancing other responsibilities. For best results, carers need to be able to take breaks from their duties, in order to enjoy a social life, take care of themselves and, in many instances, look after their children or manage their careers. Yet, many people struggle to find sufficient time for all of this, which is why they are advised to seek out a good quality domiciliary care service. Nevertheless, accepting help from a professional care agency can still be a tough decision, as it means putting trust in others. For this reason, quality and reliability are the top priorities. While respite care is extremely valuable, it is essential that the quality of that care is high, which means finding the right care agency. However, at present, England's care work force is not fully regulated. With that being said, the main independent regulator for the safety and quality of care is the Care Quality Commission, or CQC for short. It is, therefore, recommended to choose an agency that is regulated by the CQC, has been inspected, and has been rated 'good' or 'outstanding' in all areas, as is the case with Abbots Care. It is best to avoid care agencies with any 'requires improvement' ratings, and those with 'inadequate' ratings should be dismissed. You can view the Abbots Care inspection report by clicking here. Recently, there have been steps taken to improve regulation of domiciliary care in Wales, and it is hoped that similar steps will follow in England in the near future, providing greater transparency. Founder of Abbots Care. "Hopefully the new Green Paper due out this Autumn will address this." For many families, finding a good quality domiciliary care service can be the difference between being able to continue to care for a loved one in the home environment or not. However, it is imperative that respite care is provided by a regulated care agency, with positive inspection reports and a great reputation. Abbots Care are happy to work with families to provide the respite care they need. If you would like to find out more, you can email us on: info@abbotscare.com or give us a call on: 01727 891004. Camille Leavold is the Managing Director and Co-Founder of Abbots Care, a home care provider in Hertfordshire. With an experience as a health and social care consultant, she started this care agency in 1995 with an aim to provide quality care services in Hertfordshire and Dorset with trained staff.